The inner suburban Thai restaurant menu is tattooed on our foreheads. 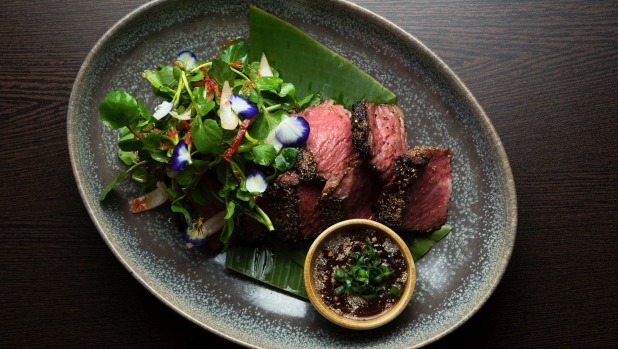 We already know what's on it – betel leaf appetisers, green curries, tom yum soups, pad Thai noodles. Bored, already. Unless, perhaps, it also offers fermented pepper relish on bone marrow, crumbed scallop croquettes and Coffin Bay oysters with compressed grapes, lime and chilli. Thai food is changing, and one of the people changing it is Aum Touchpong Chancaw​, a former Longrain chef passionate about bringing a few European kitchen smarts to traditional Thai cooking. He has flipped the long-running, French-inspired Onde into a smart but simple dining room of battleship grey walls, local artists' works, and wooden banquettes and low stools. Moon's lunar title inspires a large menu divided into Crescent (snacks), Half Moon (entrees), Full Moon (mains) and Over the Moon (that would be desserts, then). Anyone brought up on Savoury Shapes (Original Barbecue) will fall upon the deep-fried chicken ribs ($16) with the force of a recovering addict. The powdery coating of dry-roasted rice, smoked paprika, garlic powder, citric acid and sugar sparks and fizzes like electricity in the mouth. Arnott's, take note, you're missing a trick here. 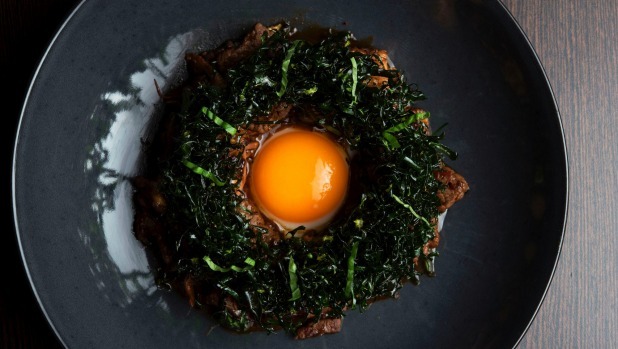 Then there's the "steak tartare" polish of Surf 'n Turf ($34), a wreath of crisp, fried basil leaves over confit octopus and stir-fried sirloin atop a fried egg, its golden yolk peeping through the middle. Another point of difference is the Big Green Egg ceramic barbecue oven in the kitchen. It's the secret weapon behind Moon's signature braised beef rib ($38), a glorious thing that has been cooked sous vide for 72 hours on the bone, smothered in tamarind glaze, then flash-grilled in the Egg until soft, fatty, scorchy, smoky and crusty. Served with cress and a sweet-sour dressing, it is – as the bloke at the next table said with awe – "ouuuttt-stttaaaanding". Some of the standard Thai dishes are fine, but still standard. Betel leaves topped with house-smoked salmon and salmon caviar ($6.50 each) taste fresh but lack punch, and an egg pancake ($26) is little more than a cold pork and prawn stir-fry under its crisp shell. 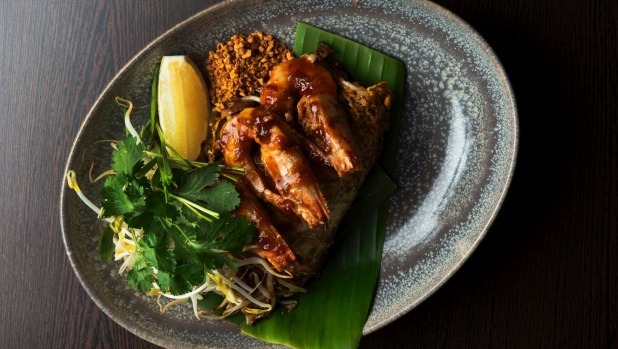 Moon's pad Thai ($22) ticks the box, all soft, stir-fried rice noodles, pork and excellent (crisp, healthy, strong) bean sprouts in a thin egg net, topped with three king prawns, garlic chives and crushed roasted peanuts. 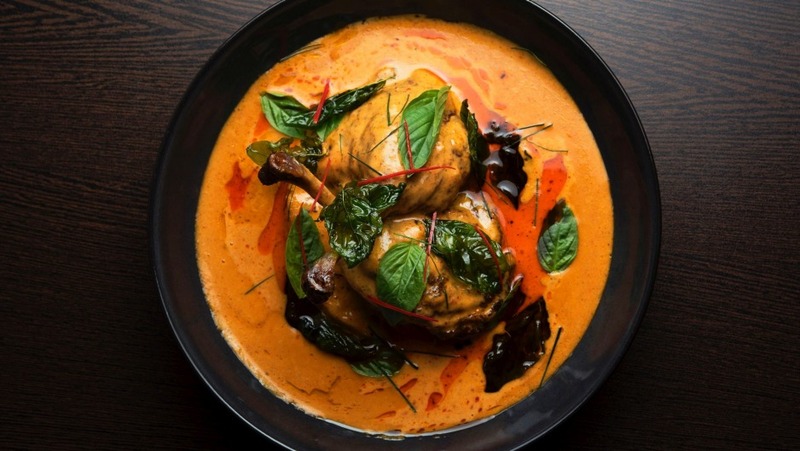 Serves are large – a Panang​ duck curry ($36) is a generous bowl of two tender confit Aylesbury duck legs and roasted pumpkin in rich and glossy, if thick, sauce of five spice, peanuts, kaffir lime leaves and coconut milk. And when all you want at the end is something refreshing, passionfruit sorbet ($16) with lychee granita, ginger, yuzu and syrupy hibiscus flowers does it with style. There's sweetness on the floor, speed from the kitchen, and top value to be had on the modest, dozen-strong list of spice-loving wines, with its ripe and fruity, delicate 2016 Te Mata Cape Crest Sauvignon Blanc 2016 from Hawke's Bay, NZ, priced at $52. 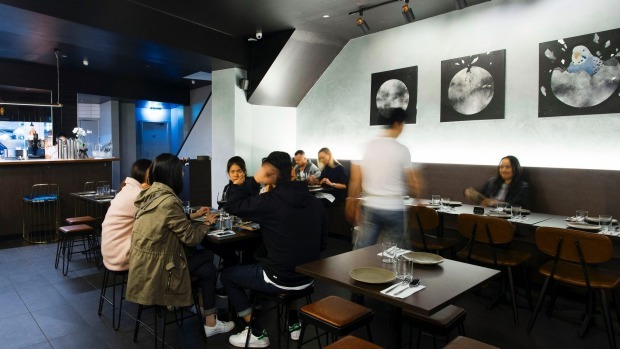 We've grown so accustomed to having solid, reliable, good-value Thai kitchens in our neighbourhoods, that we've forgotten how exciting they once were. Mind you, so have they. But here's one that bravely sticks its head up above the parapet of the regulation menu, to turn Thai food into an adventure once again. Drinks Asahi beer on tap, plus a short (five red, six white), serviceable list of spice-loving wines. Pro tip Portions are generous, so when they say their dishes are for sharing, they actually mean it.